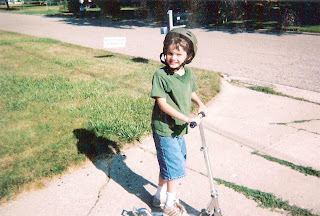 Autism Blog: A Story About Our "Scooter Boy"
Oh dear! I bet he cant wait to get it back! Living on a busy street is so hard. Our street is like a freeway. I hate it. Too noisy to even be out on the front sidewalk. Instead we go to parks to ride. I am so glad he is willing to wear a helmet. M would have no part of that and refuses. Granted, lately she won't ride her bike or scooter anyway. Argh. Love the picture and I am so excited to get back to seeing how you are doing and what you are all up to! Hi. You mentioned Ms. C took a job at Alma? Would it be the MoCi program at Hillcrest? If so, she is my son's new teacher and I just wonder how you liked her. I loved Miss M, and she left after one year to take a job in Alpena. My son is in the moderate range for autism, and I'm afraid his new teacher might not be quite as understanding as Miss M was. To Casdok: You are right on! He's scooterless and sad at the moment. To Marla: Yep, living on a busy street isn't easy for families with children. The street we used to live on in Lansing, Mi was even busier, so our new location is a bit of an improvement. Still, a quiet dead end street would be ideal I think! We live on a corner so there are four ways for trouble instead of two. To anonymous: Yes, I think Mrs. C is your son's new teacher. I didn't hear the name of the school, but I did hear that the teacher Mrs. C is replacing headed to Alpena, MI. My son and Mrs. C started the school year out great, but butted heads some by the end of the year. It may have not been her fault as my guy (who can be a sweetie a lot of the time) has quite a bit of fire in his spirit! She's very sweet and started her career as a MOci teacher. Last year, the RESD gave the Moci to a teacher in rosebush with a bigger room and the Mici class to Mrs. C. It was her first and apparently last year as a Mici teacher. That tells me her heart is into teaching a Moci class. Further, she gave up living within a real easy walking distance from her home for driving to a Moci job in Alma. Friday folders or the amount of finished work coming home may seem thinner than before because she tends to have her students do hands on "life skills" type of activities. One thing I loved about her class was her Mrs. C's cafes. I wrote about it on Dec. 19. You can find it by following this link: http://www.autism-blog.net/2007/12/mrs-cs-cafe.html. Hope that helps. Best Wishes to you and your son! A locksmith? I would think a hacksaw or boltcutter and a new lock would be less expensive than a locksmith. If you don't have a hacksaw or a boltcutter, I would bring the scooter with lock to the locksmith, to minimize expense. Glad to see that you had a good summer! To Joe: Well those aren't bad ideas except the scooter is locked up in a car trunk! You are right though... I should explore more inexpensive options.